A Special Double Celebration for Pipistrel and a market update. On 15th May 2009 Pipistrel celebrated a special double jubilee.The two important occasions were..
On the same day the 50th aircraft from the Taurus family left our production facility where It will find a new home in Brazil. The Pipistrel team is proud to announce that even in these difficult times, when many companies struggle to survive we can boast a successful economic operation, in the first quarter of 2009 Pipistrel achieved a 35% increase of our production compared with the same time period in 2008. Pipistrel have realistic hopes to double the production output leading towards the end of 2009 because we have received more orders than expected mainly because our customers are looking for more economical aircraft to operate, especially in flight training schools. Pipistrel continue with the trend of intense investment into research and high-technology equipment and manufacturing development. In 2008 Pipistrel invested 1.2 Million Euro into research and development, which represents one quarter of the entire yearly turnover. We expect to do the same again in 2009. At Pipistrel, we assign the greatest importance to the quality of our team, therefore we will continue the trend of employing highly educated experts in our new Research Institute for Applied Science – especially people with bachelor, master and doctorate degrees. Inside the new Institute, the development of a new four-seater is already well underway. Again this new aircraft concept will trigger an unexpected and large-scale revolution in the field of aviation. At the moment Pipistrel is producing 6 to 7 aircraft per month and In the past 22 years Pipistrel has produced close to 1000 aircraft, besides the Sinus, Virus, Virus SW and Taurus aeroplanes, we have just began with the serial production of a self-launching glider, the single-seat Apis/Bee. With the help of a global distributor network in 35 countries we have aircraft flying in nearly every continent. Pipistrel aircraft already fly in 50 countries. The least amount of noise, pollutants and environmental contamination. The results of this policy are aircraft which have 40% to 70% lower fuel consumption than other comparable aircraft and therefore put a lot less stress on our environment. Pipistrel are especially proud of the Taurus Electro which made her maiden flight in 2007 and to this time remains the only two-seat electric plane in the world. 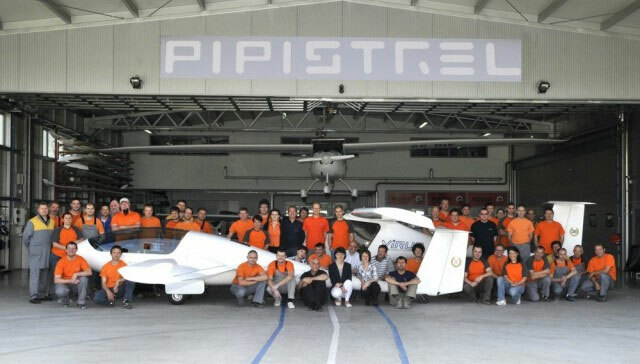 Pipistrel has proven by example that it is possible to be successful in business without polluting the environment. The facility in which Pipistrel work is 100% energy self sufficient and entirely powered from renewable sources of energy. The energy for operation is acquired from one of the largest solar power plants on the entire Balkan peninsula (110 kW), geo-thermal heat exchangers, geo-thermal accumulation field, heat pump and bio-gas co-generation power plant, all designed and built by Pipistrel. In 2008 Pipistrel claimed two prestigious titles. The influential American magazine Popular Science declared the Pipistrel Taurus Electro as one of 10 most important innovations in 2008 in the “aviation and space” category. For the future, Pipistrel have already started actively preparing for the next NASA challenge in the summer of 2011 where we will be introducing many new technologies never before used in aviation and Pipistrel continue to commit ourselves to continue promoting Slovenia through state-of-the-art technology based on ecology.